Kiril Jacob Kulish (born February 16, 1994) is an American actor, dancer, and singer who is best known for portraying the title role in the original American production of Billy Elliot the Musical. Kulish was born in San Diego, California on February 16, 1994. His parents, Raisa Kulish and KIrk Kulish are immigrants from Ukraine. His older brother, Victor, is a singer/songwriter and recording engineer, and his older sister Beata is a TV/film producer. He grew up speaking Russian, Ukrainian, and English. He started studying ballet at age five and ballroom dancing at age 8. He studied at the San Diego Academy of Ballet, and was the youngest male to be admitted to their junior company. Kiril was the winner of the Junior division Grand Prix at the Youth America Grand Prix in 2006, 2007, and 2008  and won the Hope Award in the Pre-Competitive division in 2006. Kiril Kulish won first place in Latin Ballroom at the USA National Dance Championships in 2006 and 2007. In 2012 and 2013 Kiril Kulish became the Youth USA Champion in Latin Dance Sport and will represent USA in Beijing and Paris . Accomplished Pianist, Singer, Dancer, Gymnast, Kick-Boxer, Karate and Tae-Kwan Do Fighter, Skateboarder, Guitar Player, Basketball, Baseball, Football, Volleyball, & Tennis. Fluent in English and Russian. Dialects: British Accent, Russian, Hispanic, Island, and other Accents. At a press launch in New York on April 22, 2008, it was announced that Kulish would be one of three boys to play the title role in the original Broadway production of Billy Elliot the Musical, along with David Álvarez and Trent Kowalik. Kulish performed in the musical's first preview performance on October 1, 2008. On June 7, 2009, Kulish, along with Trent Kowalik and David Álvarez, won the Tony Award for best leading actor in a musical. In all, Billy Elliot was nominated for 15 Tony Awards, and won 10, including Best Musical and Best Book. Kulish's last performance in Billy Elliot was on Saturday October 3, 2009. In late 2009, Kulish performed the lead role in the ballet The Nutcracker. In 2010, he attended the ballroom championship at USA Dance Southwest Regional Championship in Long Beach, CA. On October 27, 2012, Kiril performed alongside Jon Secada, Debbie Gravitte, Liz Callaway, and a host of award-winning singers from around the world in Loving the Silent Tears: A New Musical at the Shrine Theater in Los Angeles. In 2016, Kulish joined season 22 of Dancing with the Stars as a professional dancer in their troupe. Kulish currently resides in San Diego, Los Angeles, and New York. ^ "'Billy Elliot' Leads Tony Nominations". Retrieved 10 March 2012. ^ a b "Tony Awards Official Website - Past Winners 2009". TonyAwards.com. Retrieved November 11, 2011. 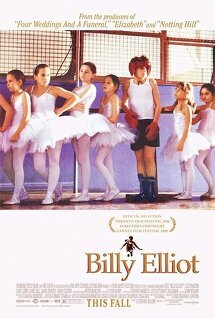 Billy Elliot is a 2000 British dance drama film about a boy becoming a professional ballet dancer. It is set in North East England during the 1984–85 coal miners' strike. It was produced by Greg Brenman and Jon Finn, music composed by Stephen Warbeck, co-produced by BBC Films, Tiger Aspect Pictures and Working Title Films, distributed by Universal Pictures and Focus Features, written by Lee Hall and directed by Stephen Daldry. Ann Reinking is an American actress, dancer, and choreographer. Her extensive work in musical theater includes starring in Broadway productions of Coco (1969), Over Here! (1974), Goodtime Charley (1975), A Chorus Line (1976), Chicago (1977), Dancin' (1978) and Sweet Charity (1986). In the 1996 revival of Chicago, she reprised the role of Roxie Hart and was also the choreographer, winning the Tony Award for Best Choreography. For the 2000 West End production of Fosse, she won the Olivier Award for Best Theatre Choreographer. She has also appeared in the films All That Jazz (1979), Annie (1982), and Micki & Maude (1984). Billy Elliot the Musical is a musical based on the 2000 film Billy Elliot. The music is by Elton John, and the book and lyrics are by Lee Hall, who wrote the film's screenplay. The plot revolves around Billy, a motherless British boy who trades boxing gloves for ballet shoes. The story of his personal struggle and fulfilment are balanced against a counter-story of family and community strife caused by the 1984–85 UK miners' strike in County Durham, in North Eastern England. Hall's screenplay was inspired in part by A. J. Cronin's 1935 novel about a miners' strike, The Stars Look Down, to which the musical's opening song pays homage. This article lists cast members of Billy Elliot the Musical at the Victoria Palace Theatre in London, since its opening on 31 March 2005, as well as the production at the Capitol Theatre in Sydney, Australia since its opening on 13 December 2007, the transferred production at Her Majesty's Theatre in Melbourne, Australia since its opening on 31 December 2008, New York's Broadway production at the Imperial Theatre since its opening on 13 November 2008, Chicago's production at the Oriental Theatre since its opening on 11 April 2010, Seoul's production at the LG Arts Center since its opening on 14 August 2010, the Netherlands production at the Circustheater in The Hague, the 2016/17 UK and Ireland Tour opening in Plymouth on 24 February 2016 and Hungary's production at the Hungarian State Opera House in Budapest since its opening 29 July 2016. Trent Matthias Kowalik is an American actor, dancer, and singer. He made his theatrical debut as Billy in the West End production of Billy Elliot the Musical in 2007. David Alvarez is a Canadian dancer and actor who was one of the original Billys in the Broadway production of Billy Elliot the Musical. He is a Tony Award winner. Nicholas Alexander Ko is an American actor, film director and screenwriter. He won the title role in Billy Elliot the Musical on Broadway in 2009. Tommy Batchelor is an American dancer currently residing in Palm Beach Gardens, Florida. Jacob Clemente is an American actor and dancer. He is best known for his portrayal of "Billy" in the Broadway production of Billy Elliot the Musical. He is currently a student at Yale College studying Russian. Joseph Ryan Harrington is an American actor, dancer, and singer currently residing in Cincinnati, Ohio. Giuseppe Bausilio is a Swiss actor, dancer, and singer. Bausilio is best known for his portrayal of "Billy" in the Broadway, Chicago, and National Tour productions of Billy Elliot the Musical, as well as his performances as "Race" and "Davey" in the Broadway production of Newsies the Musical.